Frederick White of Utah Valley University described the Soviet Union’s efforts to incorporate Ernest Hemingway into their literary canon. PROVO, Utah (Oct. 13, 2016)—Today it’s impossible to take an American literature class without at least skimming Ernest Hemingway. Though he famously spent much of his life abroad – becoming, along with F. Scott Fitzgerald and Gertrude Stein, a member of the expatriate “Lost Generation” – his work has been celebrated in the U.S. for its tight, straightforward prose, and Dr. James Nagel of the University of Georgia has credited him with having “changed the nature of American writing.” So it comes as a surprise that another nation tried to claim Hemingway as its own: the Soviet Union. In a special guest lecture, Frederick H. White – Associate Vice President of Engaged Learning at Utah Valley University – presented “Ernest Hemingway and the Soviet Literary Market (ca. 1930s),” explaining how the U.S.S.R. came to court Hemingway and why. In 2007, Pascale Casanova published her book The World Republic of Letters which posited that in order to qualify as world literature, a work must first be recognized, translated and critiqued in France. Though White disagrees with this position, he found it similar to the position taken by Soviet leadership in the 1930s as they fought to define Moscow as the capital of world culture. “If you think about the Soviet Union in the 1930s, this is not a very stable period,” White said. Stalin had only recently consolidated his power and the nation was still recovering from war and moving into industrialization. And yet in the midst of this upheaval, the government dedicated precious resources to translating and publishing works of foreign writers. As the Nazis burned books in Berlin, the Soviets presented themselves as guardians of the world’s literary traditions. However, only traditions that supported Soviet ideals were worth protecting. Ivan Kashkin, a major figure in Soviet translation, believed that he had found such ideals in Hemingway. He not only translated many of the American’s short stories into Russian, but also proceeded to write scholarly articles and commentaries in their defense. White referred to Kashkin’s work as one of interpretation and consecration: presenting Hemingway as a paragon of Soviet ideals. To do so, Kashkin used characters from his short stories and novels to craft an image of Hemingway that made him fit into the Soviet literary market. For example, in 1935, Hemingway wrote “Who Murdered the Vets?” in which he criticized the United States government for its treatment of WWI veterans. Kashkin immediately translated and published the opinion piece, adding a footnote that Hemingway was consciously on the side of the Russian revolutionary movement. Surprisingly, Hemingway complied with Kashkin’s efforts. 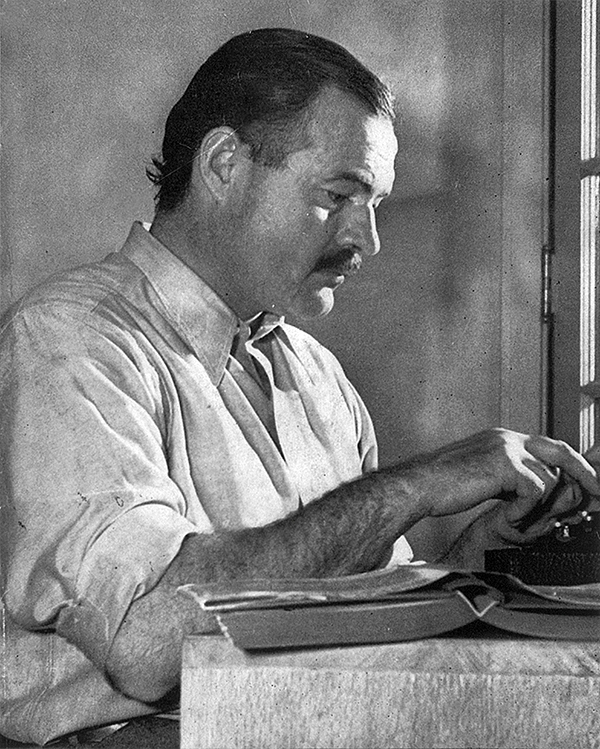 White explained, “Hemingway was very aware of his own literary career and what he needed to keep growing.” Hemingway understood that if he wanted to enter new markets, it would have to be by invitation and on their terms. He and Kashkin communicated openly, and Hemingway encouraged the Russian to continue writing about him. In 1939, Kashkin made a bold decision. “Kashkin tries to do . . . what was necessary to fully consecrate an author, which is provide them with a Soviet biography . . . and to provide an interpretation of the key literary works that would fit somehow into the grander narratives that were being expected,” White said. Kashkin proceeded to write a biography of the then 40-year-old Hemingway. Once again, he argued that readers should ignore Hemingway’s exploits and instead look at Hemingway’s literary characters in order to understand the man. This summation of Hemingway’s character is at odds with every other subsequent portrait composed by critics. But White reminded his audience that Kashkin’s goal was not to present Hemingway himself, but a version of Hemingway. Though Kashkin’s efforts to consecrate Hemingway ultimately failed, they were born out of hope that the Western author would in turn consecrate the Soviet Union with his approval. Samuel covers events for the Department of Linguistics and English Language for the College of Humanities. He is a senior pursuing a degree in American studies with a minor in editing.